Lent is the time of year where we prepare for Easter and reflect. It is also a time for fasting and continuing to instill kindness. Lent is not just about giving something up for 40 days, but also learning about Jesus’ story. For a child this can be a little confusing or harder to understand. I gathered some kid centered activities about Lent from some amazing blogs that we will be doing as a family, and I wanted to pass the information along to you. Lenten Calendar The calendar is a great visual tool for the child to understand how long Lent is, when Easter will be, and keep track of activities that are done each day in the spirit of Lent. You can print your calendar from Bloglovin here. The teacher side of me loves this graphic organizer. Pictures are a key tool in helping a child understand a concept. I like the options on ideas of what and who to pray for. I particular like the I pray for myself option. This helps the child engage in self reflection. You can print the prayer journal here. Each day of Lent a card is provided with a small scripture or story about Jesus and His words. We will be reading one every night during prayers before bed. To print your copy from Happy Home Fairy click here. 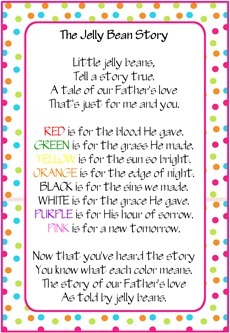 The Jelly Bean story tells the story of Easter in a way a child will understand through a fun activity using Jelly Beans. Each Jelly Bean color has a particular meaning or message. This would be a great activity to do the week before Easter. You can print this activity from Confessions of a Home Schooler here. I hope you find these ideas as useful as I do. If you have any other Lenten activities or Easter activities I’d love for you to share.